The range should offer something for frequent fliers and occasional holiday makers alike. It features two and four-wheeled carry-on bags alongside four-wheeled packing cases. The Tega-Lite line gets its "unparalleled strength" from its hard Tegris body. This isn't a material we've seen a lot of in the fashion world, but the polypropylene thermoplastic composite material should soon endear itself to audiences. It's been used in lifesaving armor, NASCAR racing cars, and NFL protective gear, so you know it can hold its own. 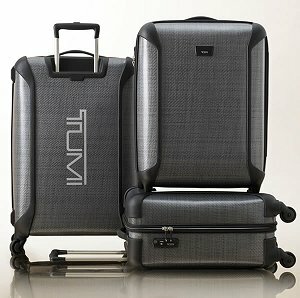 Tumi weaves the tough material into fabric, then presses it into hard sheets to create the Tega-Lite travel bags. Tumi has forged an exclusive partnership with Tegris manufacturer Milliken, which means these are the only travel bags that use the innovative material. The monochromatic color scheme isn't the most exciting around, but I really like the look of the woven texture. These bags might not turn a lot of heads, but they should be easy enough to spot on the baggage carousel. Look for the new Tumi Tega-Lite bags in travel stores this month.